As part of their very popular, well designed and just generally “very British” line of sheds this Crane National Trust Peckover Shed is a true and proper, English style shed that looks like it was handpicked out of some old East Anglian back garden. 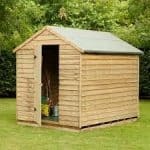 Offering a nice and compact design, nice and strong corrugated roof and some very strong tongue and groove floorboards ensure your mower and other gardening tools will have a nice and sturdy place to be stored. 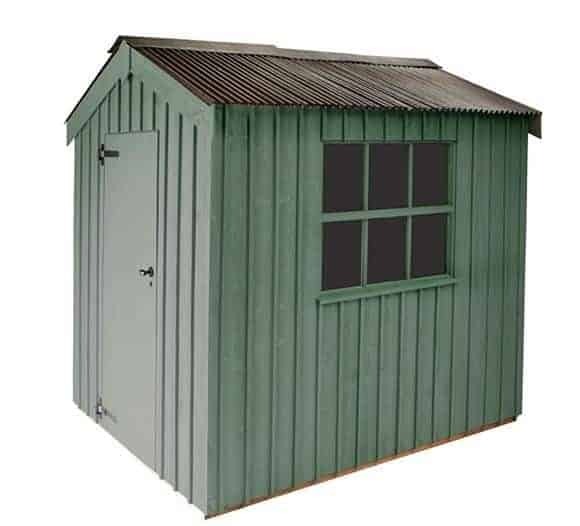 Along with that lovely corrugated roof this shed comes with a strong as an ox door that as along with keeping all of your items nice and safe, pops to life with its cast iron door hinges and old style lock. To really give the shed that little bit extra spark, Crane have included a nice window on one side of the shed that is made from toughened glass…… to stop the kids or grandkids balls getting kicked through the window. 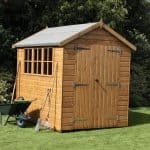 Ok let’s roll up our sleeves and take a closer gander and see if this is the right kind of shed to slot into that perfect little spot at the back of your garden. 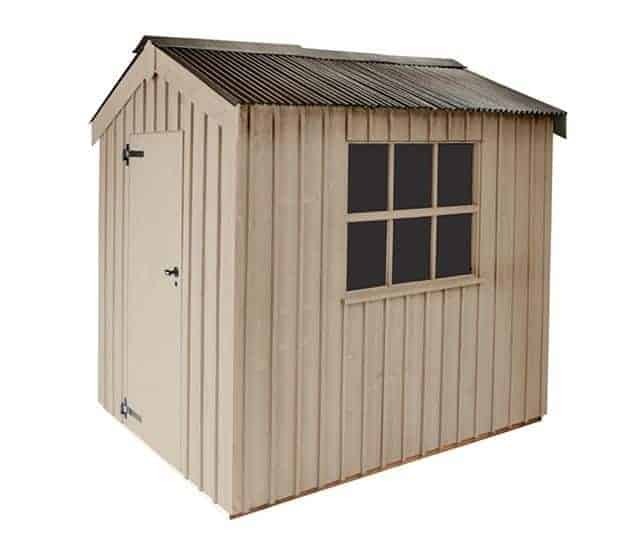 This is not a cheap shed so we aim to make sure you know if this is the right shed for you. This is a very compact shed coming in at just under 2.43 meters high. 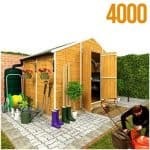 This is a shed that is meant for a gardener to store all their tools inside in a nice and safe way. The apex roof is not just here to look nice it is also there to make sure the buckets of rain that fall on it during the year (you have to love our British weather!) will just run of the shed. The apex roof design is something that we really love as it gives you excellent protection and it looks nice in the process. The roof is comprised from some very rough and tough, 19 x 125 mm tongue and groove roof boarding which on its own merit is nice and strong, but as strong as it is it does need some help keeping the rain out of your shed…… and that is where the corrugated roof comes into play. 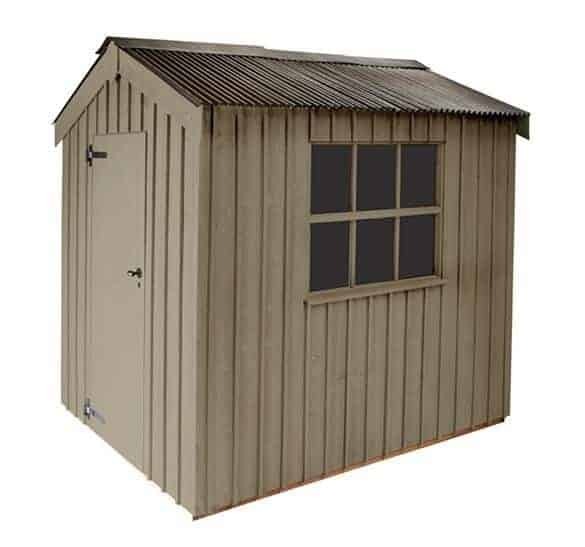 From the price, you know this is a high end shed and part of the reason the shed is a little on the high side when it comes to price is that Crane are using some British made corrugated roof sheeting. While most people (including us) will stand and stare at how nice this roof looks it is nice to have that peace of mind that no water is getting in here! The roof really does have that “English Country Garden” style to it and we really like that! 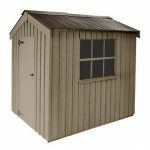 The overall dimensions of the shed are on the small size, but this is meant as a gardening shed so the size is in line with what we would expect. The width of the shed is 1.8 m, with 2.4 m of length and at its highest point at the ridge it is 2.43 m.
The cladding that is used here is very interesting, Crane have gone for a very traditional sawn board cladding which does give the shed a very tight and distinctive look to it. This is very strong wood and while we do love our shiplap cladding here, we do think that the Scandinavian Redwood that has been used will be strong enough to take on our most harsh winter. So while sawn board cladding may not sound as fancy as what most modern sheds are using these days, you have to keep in mind that this whole shed is designed with a classic look in mind and a huge part of pulling that off is the cladding. The framing of the shed is 30 x 50 mm sawn board cladding and once again it is made from that strong Scandinavian Redwood. Using the same kind of wood throughout mans that from a aesthetical point of view this is a nice well designed shed, but make no mistake about it just because this wood looks “pretty” it is also incredibly strong and will be more than up to the task of taking the odd hit with a ball or even you bumping into while pottering about in the garden. For the flooring, Crane are using the same 19 x 125 mm tongue and groove boarding that was used for the roof. This is nice and tough stuff and unless your mower is the same weight as a small tank, you will be able to store pretty much anything you want in here without the floor buckling an inch. Crane offer a two year warranty that will see them come and fix, replace or do whatever needs to be done to make sure your shed is back to its best. They do have a few “terms” when it comes to their guarantee. 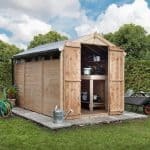 To start with their warranty only covers what they deem as “normal use” general wear and tear is not covered and if you ask them to build your shed on an area of your garden that is not level then this will also void your warranty. To be honest none of the restrictions that they have are that out of line……… and let us tell you we have seen worse! Now this is part of the Crane, Peckover Shed that we really loved! There is a single door here at a size of, 710 x 1800 mm ledged and brace door that just has a look that says “you aint getting in here son!” those black cast iron hinges really pop out and you and look great in the process, but they are also very practical and mean you have no hassle opening and closing the door. When getting your mower in the shed, last thing you want to do is have to wrestle with the door! 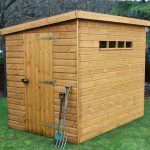 To keep you items extra safe they have included a mortice lock and a nice black door handle which will keep your shed secure. We have seen many sheds of this size where the manufacturer do not bother with a window. So we love how not only have Crane added a nice window to one side of the shed, but it is made from some toughened glass. Most sheds these days decide against using real glass so it is nice how this one is using some nice and tough glass. The frame has been expertly made and just adds to that classic British feel of the shed. Well we talked about the mortice lock just up above and that will ensure that your belongings are kept nice and safe. The window is made from toughened glass so it would take a great deal to smash the window. While some may not like the idea of a window as it can let nosey people peek inside. Well we say a nice curtain can really add to the overall look of this shed if that is a concern of yours. Crane go a little bit crazy when it comes to customising their sheds. They offer six different colours for your shed to be painted in. They have Wades Lantern (kind of brown), Terrace Green, Dome Ochre (very faint wood effect), Earls Grey, Disraeli Green and last of all we have Painters Grey. So you have a good selection of colours and unless you have some kind of gothic garden with gargoyles and gravestones all over the place then you will have no trouble finding a colour to suit your shed. This is just such a nice looking shed that really does capture the classic, English countryside style they were going for. It is well built and that Scandinavian Redwood will last for years and years! As it is this is a shed that will last a very long time. The reason for this is that it is built by Crane themselves, you know it is being built correctly so that will only help add to its longevity. If you really want to go all out though some wood treatment or perhaps some extra floor supports are something you may want to consider. 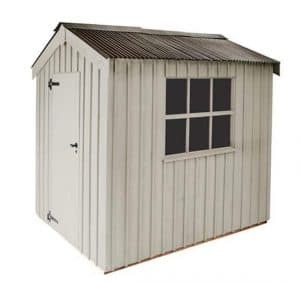 This is a very compact style shed so keep that in mind. It is meant for a person looking to store a mower and just a few other gardening items. 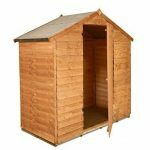 Once inside it does seem more spacious than the dimensions make it seem, but this is a small shed so make sure you know that going in. Crane do all the work for you! So all you do is place the order and they come to your house and install the shed. This can lead to you having to wait a long time for your shed, but it also means that there is no hassle for you. Look this is a very expensive shed for the size that it is. When you buy a shed like this you are really buying it to look nice in your garden just as much as you are to actually store items inside it. As a “decorative” type of structure in your garden we really cannot fault it, but from a storage point of view, you really are not getting a lot of storage space for your money. Final Thoughts: Look we do love the look of this shed. 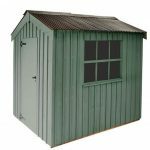 It has a classic and very English design and it is made from some incredibly strong wood and built by master joiners…… but as an actual storage shed the Crane Peckover Shed is just lacking the space to really warrant that fairly hefty price tag. But at the end of the day if you want something that looks nice, will last a long time and perhaps best of all not require you to lift a finger to install then you will be very happy with this shed.